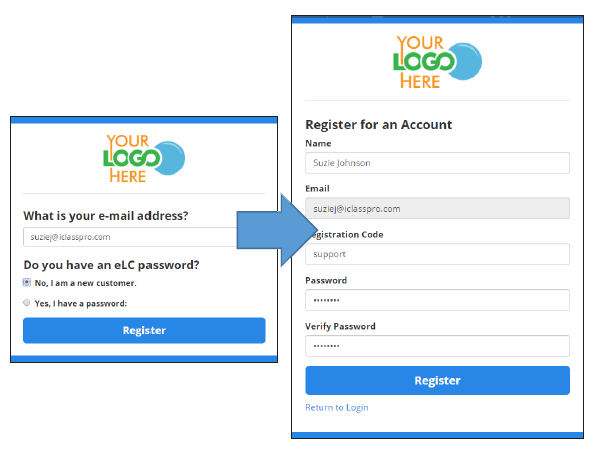 In order to allow staff members or users to self-register in iLearnPro, you must have registration codes set up at the account and/or organization level. Organization registration codes will automatically assign the user to the corresponding organization. 1. Enter the new student’s Email Address. 2. Choose "No, I am a new customer." 4. On the form, fill out the Name, Registration Code, and Password fields. 6. Check your inbox for a confirmation email to verify your new user profile. 7. Follow the verification link in the email. 8. Enter your desired password. 9. Click the Set password button. Each user is considered a student because each user can register and take courses, regardless of his/her role. From the Students page, you can view the information on file for all users or register a new user with an email address. Click on Students in the Navigation bar to begin. 2. Enter the student’s Full Name. 3. Enter the student’s Email address. 4. Assign a User Role. All roles are potential students. a. Account Administrators have full access, including settings, user creation, organization management, reports and course creation. b. Organization Managers are restricted access for user creation and reports by organization. c. Users can only view their profiles, register and take courses. 5. If using Organizations, assign the user to an Organization. 6. 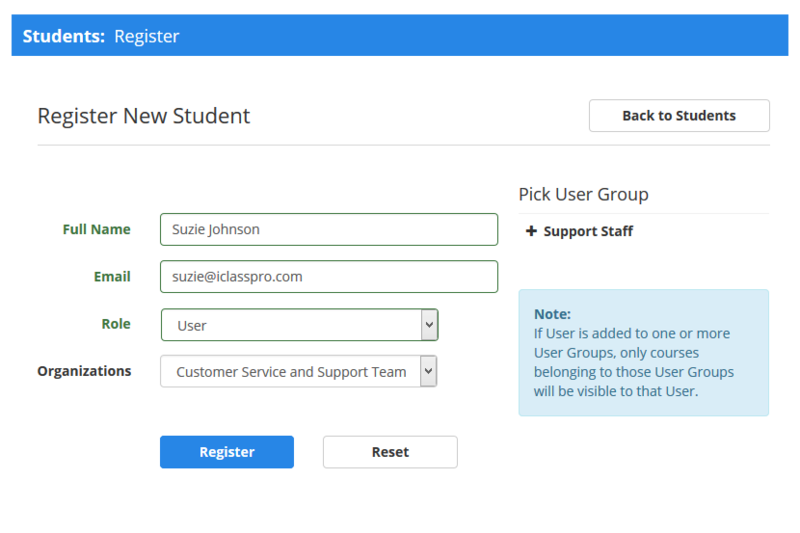 To restrict course availability, select one or more User Groups. This will send an email to the user with a verification link to confirm their account and set up a password to complete setting up their new account.